Develop a greater understanding of first year algebra concepts with this sourcbook of puzzles and problems. Meets the new NCTM Standards. 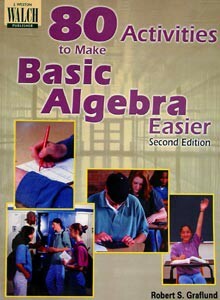 It covers basic equations, inequalities, fractions, graphing, and more. Grade 6 - Adult. Reproducible Teacher Book. 196 pages. From Walch Education.